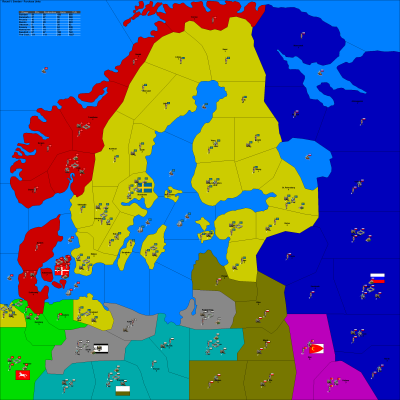 The Great Northern War (1700-21) ended the Swedish Empire, leaving Russia dominant in the Baltic Sea and a major player in European politics. The war began as a coordinated attack on Sweden by the coalition in 1700 and ended in 1721 with the Treaty of Nystad and the Stockholm treaties. It was fought between a coalition of Russia, Denmark-Norway, and Saxony (also the Polish-Lithuanian Commonwealth from 1701 and Prussia and Hanover from 1715) and many smaller northgerman states on one side and Sweden, which was partially helped by the Ottoman Empire (who later left the war) on the other.